Fifty years after the small island nation of Nauru gained independence in 1968, the island landscape has changed considerably and the population doubled. 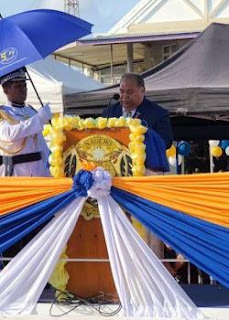 The once dominant phosphate industry is no longer the backbone of the economy and the nation of just over 11,000 has attracted more diversified and robust economic base today, said President Baron Waqa in his address to the nation Wednesday to mark the nation’s 50th independence celebrations. “The last 50 years has been a colossal learning experience for us on a national and personal level. We have experienced great fortunes and happiness and we have endured misfortunes and hardship under very difficult circumstances. “The economic meltdown that besieged our nation at the turn of the century was a wake-up call. We went from boom to bust and it was unprecedented in our nation’s history. President Waqa acknowledged the support from Pacific Island Forum Countries through the Pacific Islands Regional Assistance to Nauru (PRAN) and various bilateral assistance programmes ensured the nation got back to its feet. The establishment of the Australian Regional Processing Centre in 2012 was a driving economic force of development for Nauru. Since its establishment, the demand on services, infrastructure and labour has been overwhelming, said President Waqa. Closer ties with other neighbouring Pacific nations through airline and maritime transportation services have also boosted development in the Nauru’s struggling economy. “Nauru Airlines benefited greatly from being a one aero plane airline to a five plane operation with one dedicated freighter. The airline capitalized on the processing centres to spread its wings and it has been very successful in opening new markets especially in the northern Pacific, said the Nauru head of government. He said the airline continues to show a welcome turnaround to profitable operations compared to the turbulent years of the past. “The airline continues to expand its services with the addition of Guam forecast to commence in late March 2018. The freighter services are also expanding steadily with regular flights into Tarawa to assist the export of tuna and Australian domestic charters for Qantas. President Waqa announced in 2018, the airline will commence a joint freight services with Air Niugini. The airline also has closer ties with other regional airlines including Solomon Airlines and Air Vanuatu. It has also acquired a new hangar in Brisbane to provide timely maintenance and turn-around of aircrafts. President Waqa said improvement in transport services is not only limited to the skies but in the maritime sector as well. His government has implemented the Nauru Port Project to commence in the third quarter of this year, will provide good and efficient port facilities. Government I working with the Asian Development Bank, the Green Climate Fund, the Government of Australia and the Japan International Co-operation Agency (JICA) to realise the AU$100 million project. The Nauru President also welcomed the re-establishment of the banking system two years ago and thanked the confidence of Bendigo Bank Australia to provide banking services for the people. “The set-up of foreign companies in Nauru such as Digicel, Vital Energy and Bendigo Bank have only happened in the last few years. This is testament of the growing confidence in the Nauru economy by these companies. These companies provide vital services to the people and in return they have benefited tremendously. “The services that Digicel brought eight years ago has greatly improved telecommunication services on Nauru. The proposed installation of a submarine cable by early 2019 is expected to greatly improve connectivity with the outside world. It will open many new opportunities in areas such as health, education, telecommunications and investment. As a result, President Waqa invited other potential investors to discuss opportunities for investment with his government. Heads of Pacific Island Governments and high level representation from foreign diplomatic partners including the foreign ministers of the Georgian break-away republics of Abkhazia and South Ossetia were present at the 50th anniversary celebrations on Wednesday. On 31 January 1968, Nauru gained independence and the event was witnessed by representatives of the tripartite governments – Australia, New Zealand and United Kingdom - that governed Nauru.